I'm almost ashamed to write out a recipe for these delicious indulgences because they are so incredibly simply to make. These little dessert bites came about a few nights ago. Do you ever have a late night sugar craving you just can't soothe? It's not the most healthy feeling, but, let's face it, it happens to the best of us. I could have settled for a little piece of dark chocolate only but I knew I wanted to turn my craving into something I could share with all of you... and this is how these little chocolate discs made their way onto my kitchen counter. They take minutes to put together and are also perfect to serve with a cup of tea or coffee in the afternoon. I've had different versions of these growing up - they're called 'mendiants' and are basically chocolate discs topped with candied fruit. You can try these with different variations of fruits and nuts - I love the combination of salty pistachios with sweet candied papaya but walnuts and candied orange are delicious too, as is candied lemon and toasted almonds! You can lay these out on a parchment-lined cookie sheet, but I like to use a Silpat for projects like these. Melt the chocolate in a double boiler until smooth. Using a small spoon, form discs of chocolate on a Silpat mat or parchment-lined baking sheet. Try to create as even a base as possible. 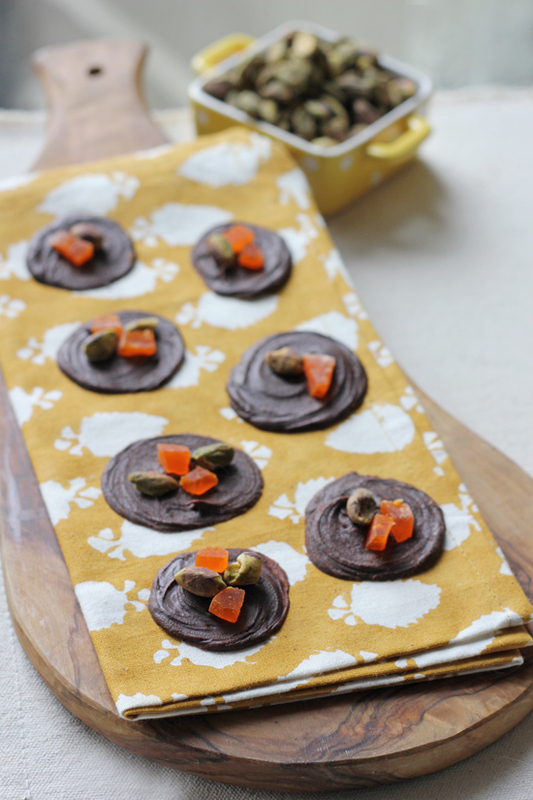 Top with papaya and pistachios. Leave to set completely before peeling off and serving. Enjoy! What a lovely flavour combination! And such a pretty photograph as well. These are lovely to look at and make me want to get into the kitchen and play. Thanks for sharing. Yum! Thanks for sharing these look delicious. I was wondering if you would you be interested in sharing your articles with other like- minded people in the Toronto Foodie Scene. We are building an online community of local bloggers who write about topics related to the urban food scene in the city. There's no shame in simple when the flavor combination is so unique and the presentation so beautiful! Great photo. OMG ...estos medallones me los llevo todos de una vez a la boca ,que maravilla es una bocado irresistible,abrazos hugs,hugs.